I’m not really a product reviewer type of person as this blog is just about things that I like and I sort of expect that stuff I buy to do what it’s supposed to do. Occasionally though some things are so good they warrant a bit of recognition I reckon. I’ve got a fantastic messenger bag that I’ll write about in a little while but first some shorts. 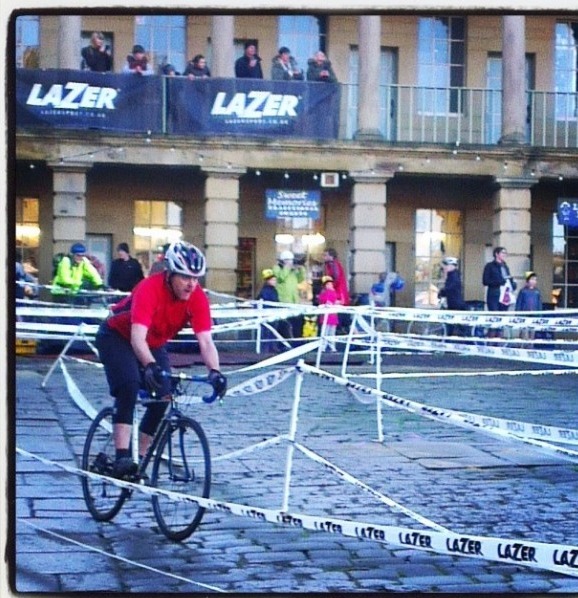 I wear shorts most days, as I ride most days and those shorts tend to be of the baggy cycling variety worn over liners in the summer or as in the pic of me above competing at city cross over bib 3/4 in the winter. Back in the summer despite various bits of darning my old shorts had given up the ghost and in looking around decided to give the new howies MTB shorts a whirl. Now I love howies stuff and I hardly ever ride without one of their merino tops on and off the bike I’ve got jeans, T’s and jackets. It’s great that they are now independent again and can box clever and for me personally it feels good to support a Welsh company that produces good ethical gear so I was interested to try out some of their newish at the time cycling specific gear. First up out of the packaging you could tell the quality, there was a heft and solidity to them and as soon as I tried them on I knew that these were a well thought out piece of kit. Whoever designed these rides a lot. Any of us who ride will know that if you are not wearing bib shorts then with baggies there is a risk of things moving around the shorts sliding and basically showing bits of yourself that you and the world would rather not see. Not with these bad boys, a high cut back of the shorts make them fit beautifully as you ride. They are a bit more tailored than my normal shorts but with a stretchiness built in so they will move with your leg movements. I liked the cut a lot, no material flapping all over the show but enough room for some G-Force pads if you want. Despite the heft I mentioned at the start they don’t feel heavy on just well made and there are large zipped vents for cooling in the hotter months (remember them). The material is fantastic, comfy, it moves with you and it’s tough taking all I’ve thrown at them no problem just wang them in the wash and voilà just like new. They’re not waterproof but will shrug off a shower but when it really hammers down they are still nice to ride in as the bit of give in the material means they will move with you even though saturated. They were a bit more than my normal shorts but as my mum always said you pay for what you get and in this case that’s absolutely true as what you get are a fantastic comfy pair of shorts that you can wear day in day out. Nice job howies.